Looks like I was a day late on this. 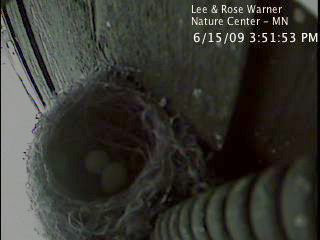 Paul pointed out today that there are two new eggs in the phoebe nest. Since they lay one a day that means the first egg of the second clutch of the year was laid on Sunday morning. I'm holding out hope that Cowbirds won't lay eggs in the nest again but only time will tell on that.